It’s been wryly said that the first rally came after the first twenty owners of “horseless carriages” met at a pub. Disclaimer: there may be little, if any, truth, to that but it is true that car rallying sprang into life very early in the history of the car. It is generally accepted that the first rally was the Monte Carlo Rally of 1911. The format, without the name as such, goes back even further, with the 1894 Paris – Rouen Horseless Carriage Competition. As cars, or automobiles, developed, and the technology evolved, rallying grew in popularity. Worldwide, various formats grew, with perhaps the best known being the WRC, with intercontinental rallies also proving popular. All of these take money, and sometimes lots of it. So for those with an eye on the economic side? Australia’s world renowned for the larrikin streak and sense of humour and with a strong aftermarket car culture various forms of rallying have come and gone. One of the newer ones has, at its heart, what Australia holds dear. Mateship. Called the Shitbox Rally, drivers have cars that hover around the $1000 and are driven on a variety of road surfaces. The funds raised go towards cancer research via the Cancer Council of Australia. The rally has spawned a child, and this is called the Mystery Box Rally. One key component of the regulations is that the cars must be at least 25 years old. 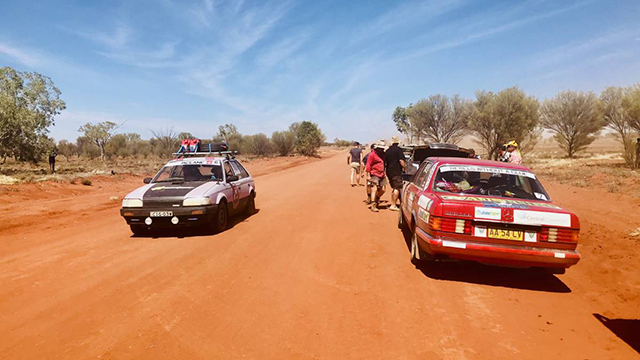 It will be a looped drive, starting and finishing at the same location, and in October of 2018 the rally began from Mildura, in Victoria. Founded in 1887, the town is situated around 100 kilometres east of the South Australia/New South Wales/Victoria border and sits on the banks of the Murray River. It’s a beautiful little town and ideal for the rally start. The cause itself is identical to the Shitbox Rally, with funds raised (teams are asked and expected to raise a minimum of $3500) going towards cancer research. Teams cover incidentals such as registration fees, food and accommodation, and fuel for around 2,500 kilometres. To add to the enjoyment and the struggle, the regulations stipulate that only two wheel drive cars can enter. All wheel and four wheel drive cars are excluded, as are historic and vintage vehicles. The organisers, with perhaps a wise eye, also stipulate that the car to be entered should be cost effective in the possibility of a breakdown. Smartly, the organisers limited each team to just two drivers, again with an eye on the potential for carrying passengers, they being those that have had a vehicle give the ultimate sacrifice. Drivers are kept in the dark as to the day’s route overnight – which adds the element of mystery, with information only provided to the teams early in the morning. And organizers are at pains to point out it’s not a race, as such. The winner is judged on how much was raised, the actual condition of the car (or, how hopeless it is), the joie de vivre the team exhibits, and literally anything that organisers decide on as the event progresses. The 2018 Mystery Box Rally saw something in the order of over one hundred cars entered, ranging from a 1992 Toyota Camry wagon to a 1993 Ford Laser, from a 1990 Toyota Celica to a 1993 Holden Commodore wagon. Most teams reached their minimum $3500 amount, with Jasmine Brill & Felicity Pollock, in Fergus, a 1992 Mazda 626, raising $13,607 under the team name of “All The Gear And No Idea”. “Two Burkes In A Merc”, Paul Marsh and John Koerner rallied a 1989 Mercedes-Benz 300C and snared $11,700, whilst Lindsay and Nicholas McAulley raked in $5725 in their 1982 Volvo 244GL, an unbreakable car if there is one. Have you ever entered the Mystery Box Rally and have a story to tell? Head over to the Rare Spares Facebook page and let us know all about it in the comments section below this article!